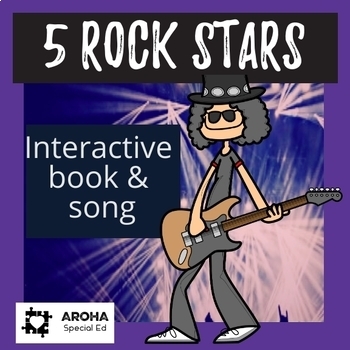 *A fabulous rock star interactive book and song. Get your air guitars going and perhaps have a microphone at the ready. *Great for special education and early years classes. The book is adapted from the song and is fabulous for emergent and transitional readers. *Lots of opportunity to target many goals including social (waiting, turn taking, participating), communication (attending; core language - particularly 'more', commenting, requesting), reading and numeracy. 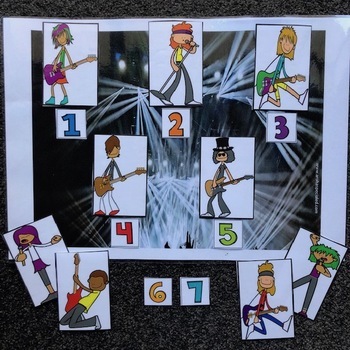 *** Great for older learners still at an emergent level of literacy and numeracy. 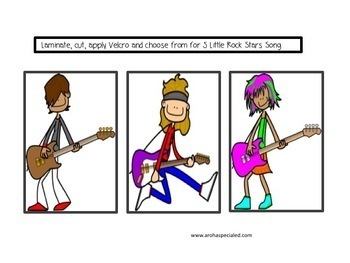 Background and pieces to accompany the Help Kidz Learn app and web song of 5 Little Rock Stars. Play the app or web version and use interactive pieces or Sing yourself using one or both verses dependent on your student(s). Extra Rock Stars included for groups larger than 5. Print, Laminate, add velcro. 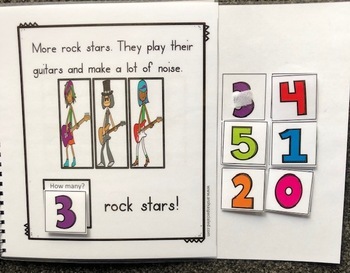 Count the rock stars on each page and select the appropriate number. Apply to the page. See product for full instructions on how to use. Don't forget to follow me for more great products. Want to gain some credit for cheap or free products? You can by rating this product and providing a comment. Simply go to your TPT "My Purchases” page and click the "Provide Feedback" link to the right of the date you purchased.